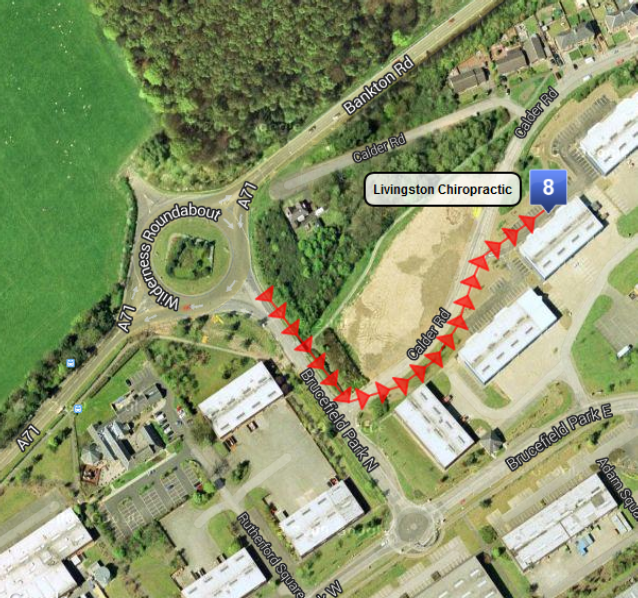 Livingston Chiropractic, Unit 8 Brewster Square, Brucefield Industrial Estate, Livingston, West Lothian, EH54 9BJ. 01506 238384. Our clinic is located at 8 Brewster Square, part of the Brucefield Industrial Estate, just off the A71 in the Bellsquarry area of Livingston. We are close to Adambrae and Murieston and only minutes from the centre of Livingston. Leave the A71 at the Wilderness Roundabout and turn onto Brucefield Park North, signposted Brucefield Industrial Park, Bellsquarry, Murieston South. Take the first left into Calder Road, signposted Bellsquarry. Turn right at the waiting box into Brewster Square. Livingston Chiropractic is number 8, situated between Astro Gymnastics and Synergy Fitness. Download printable driving directions here.